It is time to welcome back Charleston Area Alliance’s Brown Bag Concert Series. Opening concert is scheduled for May 19, 2017 beginning at 11:30 a.m. at Davis Park between Capital & Summers Streets in Charleston, WV. So grab your lunch and head to Davis Park. The first concert features the Ryan Kennedy Trio and the John Adams Middle School Jazz Band. 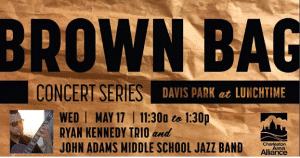 Sponsored by American Medical Facilities Management (AMFM), the Brown Bag Concert is a FREE lunchtime concert series. Grab your lunch from a participating Downtown Charleston restaurant, or pack your own, and make your way to Davis Park for the free concert. The concerts are designed to showcase the talent of local musicians, encourage people to get away from their desk at the lunch hour and put a spotlight on the green space in Downtown Charleston. Local musicians perform in the park 11:30 a.m. to 1:30 p.m. the third Wednesday of each month May through October. Tables and chairs will be setup for those attending. Music is provided with partnership from the American Federation of Musicians Local 136. Call Susie at the CAA with any questions. 304-340-4253.